The flagship of the Palette line! An extensive set of orchestral instruments to bring your cinematic ideas to life. Introducing True Ensemble Recording for strings, brass and woodwinds ensembles - each recorded in 2 different sizes with up to 10 articulations. Plus womens and mens choirs, percussion, trailer tools, grand piano and harp. Kontakt Player and NKS compatible. 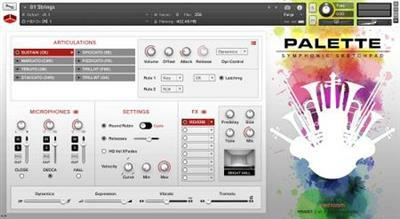 Palette is a series of thematic professional orchestral and cinematic Kontakt virtual instruments for songwriters and media composers. It was recorded in a dedicated hall with world-renowned performers by a passionate and experienced team of sample makers. It was a dream come true for us to make and we hope this expansive set of scoring tools inspires you to write some great music. There's an awful lot of content here, so to make things more accessible we divided it into multiple products. The first is "Palette - Symphonic Sketchpad," which contains the building blocks to quickly and easily bring your cinematic ideas to life. Then, to add detail and color to your compositions we've put together additional tool sets we call "Brush Packs." Brush packs focus on deeper and more specific scoring elements like orchestral FX, percussion loops or true-legato melodic ensembles. Pick up the tools you want and not the ones you don't. Since all Palette instruments were recorded in the same hall by the same production team and the same musicians, they complement each other perfectly.